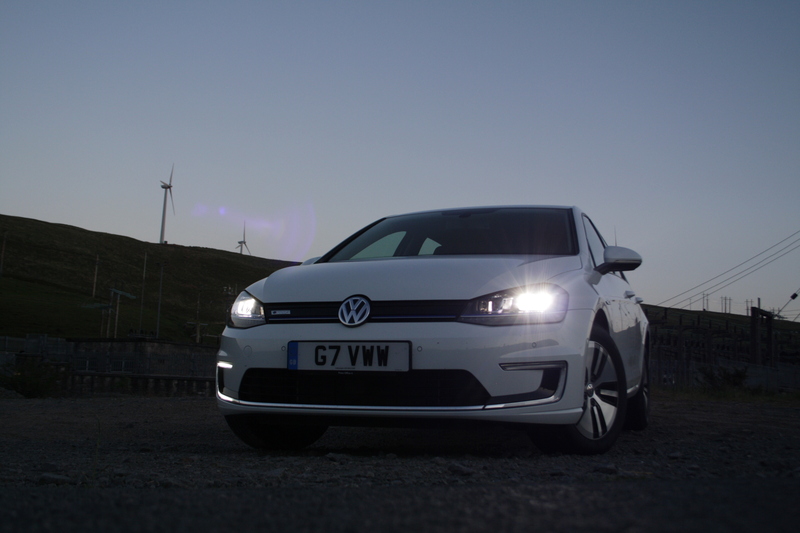 Road Test: Volkswagen e-Golf – Clever Tech – HubNut – celebrating the average! Road Test Part 2. Part 1 here. The Volkswagen e-Golf is not a cheap car – the one I’m driving has a retail price of £27, 395, which includes the £5000 plug-in grant from the government. However, it does pack in quite a lot of tech, and has some features not found on other EVs. That said, it also lacks kit in some ways, as we’ll find out on my Downsides report. LED headlamps certainly help you keep an eye on the world. The ACC is far more impressive in reality, and a lot more useful. You set your cruise control speed as normal, but a front-mounted radar will slow the car if you encounter slower traffic. Here in rural Wales, I found this system very useful on busy trunk routes. You find that all you have to do is steer. For miles and miles! 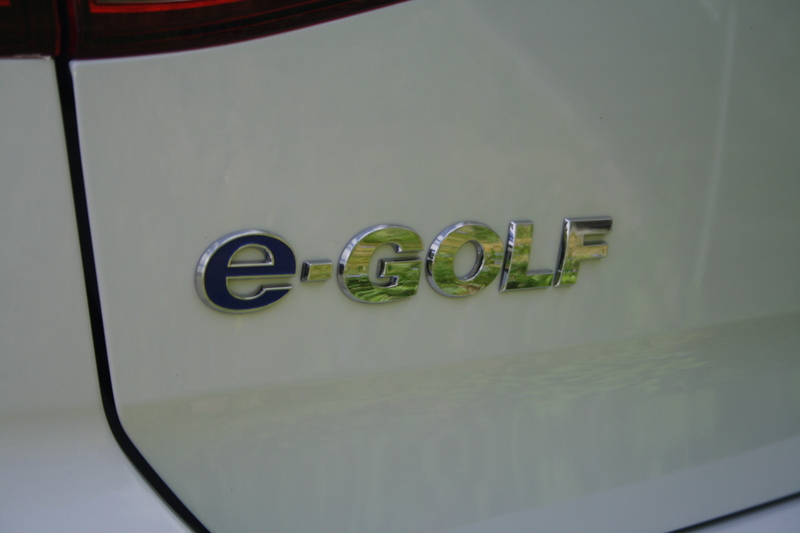 Follow another car and the e-Golf will even slow down for bends (assuming the car in front does!). It’s hugely relaxing – once you’ve got used to trusting the car. It even spotted a motorcyclist turning left, and slowed the car right down behind them as they turned. Most impressive was how it brought the car to a halt at a set of temporary traffic lights as the car in front did likewise. Oddly, I found this reduced control quite comforting. It was far more relaxing (and better for battery life) to sit back with the slower traffic rather than attempting lunatic overtaking manoeuvres. A petrolhead should not like this hint of automated driving to come. Thing is, on a really busy road, it’s hard for a petrolhead to have much fun anyway. The result is, I really like this feature. Trusting it is tricky at first, as you’re convinced that parked cars and oncoming traffic will confuse it. It didn’t get confused once during over 100 miles of driving with it turned on so far though. Other smart tech unique to the e-Golf includes LED lighting front and rear. The headlights are formidable, yet consume much less power than Xenons or Halogens. There is also a multifunction display, which can tell you a lot about your driving – average economy, speed and so on. I didn’t find it as good as Nissan’s system, on which you can monitor power usage as you drive. Then you can see what difference climate control and headlamps make to power consumption. There are at least eleventy twelve ways of playing music on this car, with USB ports, SD card ports and even an Aux input. The radio is DAB and allowed me to listen to the cricket on Five Live pretty well, even in remote Wales. There is an auto-hold function, should you be performing a lot of hill starts. This means that if you bring the car to a halt, you can remove your foot from the brake pedal and the car will remain where it is until you accelerate. Saves blinding people with the brake lights, and means you don’t have to use the stupid electronic handbrake. (not a specific e-Golf problem, I absolutely detest electronic handbrakes). You can turn auto-hold off, which means the car will creep as you release the brake, much like a conventional automatic. I didn’t explore the Car Net, but this apparently allows you to access some functions from your smart phone. That’ll be things like climate control, lighting and charging status – useful because there’s no way of telling at a glance how charged the vehicle is. Nissan’s EV range has three lamps that indicate rough charge level. Other scary tech includes Automatic Post Collision Braking System. If you smack something, the car will slam the anchors on to try and stop you smacking something else. I opted not to test this functionality, at the time of writing. Nor did I test the Driver Alert System, which tries to guess if you’re falling asleep. It monitors your driving to spot anything out of the ordinary – presumably like swerving unnecessarily or departing from lane. Optional but fitted to this vehicle are the horrible, bland white paint (£260), the winter pack (£380) which consists of heated seats and washers, a wireless heated windscreen (£295 – a wired screen is standard) and the £315 fancy pants conductive mobile phone connection to use the car aerial. This apparently includes a phone holder built into the centre armrest, but I could find no such thing on this car. I even read the manual. Next time, some of the less good points of this very impressive car.